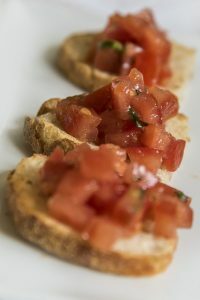 √ The "food of the gods" from Liguria: this is "bruschetta"! 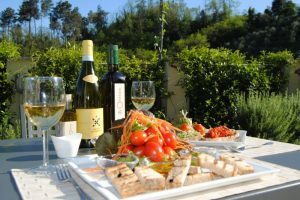 What to eat in Liguria? Which are the best recipes? Which products should be preferred to prepare them? It's simple as the cuisine of the region, made of a few genuine ingredients and…simply irresistible. 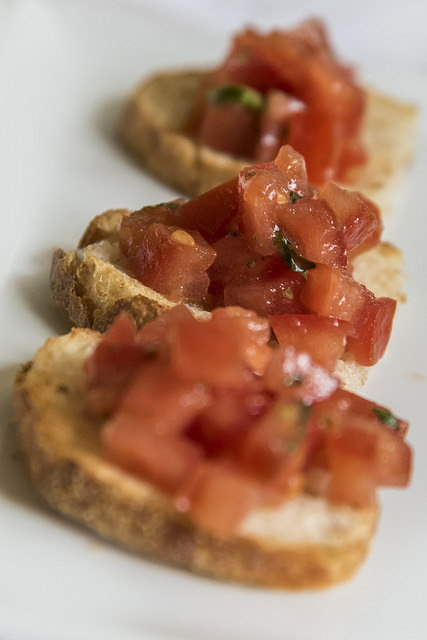 We are talking about "bruschetta", one of the most popular foods of the Ligurian and Italian table. Why? It takes very little to understand it. Sit down, if you like with a glass of good fresh wine in hand to accompany it, and start enjoying this slice of simple toasted bread, garnished with some of the best products from beautiful lands overlooking the sea. A drizzle of oil, taste of garlic, diced tomatoes and basil: this is the simplest way to give you a tasty culinary experience ... without problem with your diet, given the caloric intake not high (128 calories per 1,7 oz of bread) of this specialty. 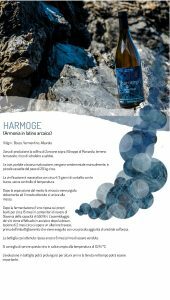 An example of healthy and tasty Mediterranean cuisine that - we are sure - you will love, thanks to its versatility: it's perfect for an aperitif, but also for a dinner and as a snack, and you can try it in many different versions. Many Ligurians, for example, like to add thinly cut onion, but also oregano, pepper, olives and anchovies in oil: in each version, it will be excellent. But it does not end here: it is difficult to make "bruschetta" it with your own hands? Definitely no! Simple, crunchy and tasty, it is also very easy to do: pay attention to the baking of the bread, which must be roasted correctly, without being burned and keeping a soft heart, and to balance the flavors of the ingredients and spices. We are sure that you will become very good "bruschetta-specialist" in a short time ... after being excellent tasters! So, have a nice…"bruschetta" - Ligurian and not - and, to taste it better, we suggest you to accompany it with a white wine of the area, such as a Vermentino or a Cinque Terre Doc. If you want to chooese a special label, try Harmoge, the wine of Prima Terra (www.primaterra.it/en/) - a small winery in which Arbaspàa Tour Operator invests part of the proceeds from tourism for the care of the territory and a high quality wine production, under the guidance of the winemaker Walter De Battè -: this wine, in 2017 received the "Grande Vino" award in the prestigious Slow Wine festival.